Whether your project is large or small, it will be managed in the same professional manner. Upon receipt of a purchase order, a dedicated project manager will allocate the estimated hours to the Master Schedule for each department. The key dates will be established and then communicated to the customer. Soon after, a project kick-off meeting will occur where the manager from each department will attend and collectively review the project and discuss critical paths, failure modes, and opportunities for improvement. After the initial design layout is established and the controls architecture is outlined, the customer will be invited to a formal design review meeting. Production will commence once the customer has signed off on the design. 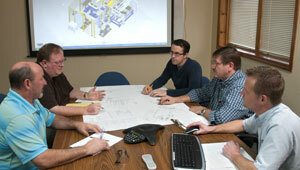 Each week, there is a manager’s meeting where each and every active project is reviewed in depth. Throughout the build process, the customer is kept up to date with progress reports from the project manager. Prior to the formal run-off at our facility, we will have an internal run-off to be sure the machine is ready. After the customer signs-off on the machine, the project manager will coordinate delivery, installation, and start-up at the customer’s facility.